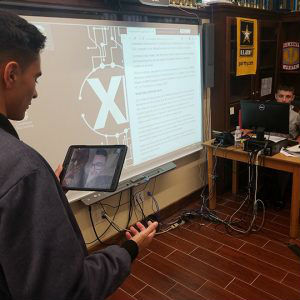 Waynesboro, VA – The Fishburne Military School CyberPatriot Team, coming off a 2nd Place finish in last year’s National round, is looking to continue building upon their successes throughout the 2018-2019 season. On Friday, the team held a practice round and conducted a Skype conversation with Lt. Hickey and Cadet Wallace of the James Madison University Cybersecurity club. “Being able to interact with the JMU team is a tremendous boost for our team. It helps our young men to see what kind of opportunities exist on the college level and how they can continue forward with their interest in the field,” notes FMS CyberPatriots team advisor LTC Robert Hunt, FMS SAI. Fishburne’s six-man CyberPatriots team is Captained this year by Cadet Sebastian Hussain (Centreville, VA). The team was first formed at FMS in 2012. In the rounds of competition, teams are given a set of virtual images that represent operating systems and are tasked with finding cybersecurity vulnerabilities within the images and hardening the system while maintaining critical services in a six hour period. Teams compete for the top placement within their state and region, and the top teams in the nation earn all-expenses paid trips to Baltimore, MD for the National Finals Competition where they can earn national recognition and scholarship money. The goal of every CyberPatriot competition is to find and fix vulnerabilities in their images. These images range from simple (e.g. giving users strong passwords) to much more complex. Some rounds also include networking challenges in the form of quizzes and Cisco Packet Tracer activities. Teams can also gain points by answering questions about their actions on the image. When teams fix a vulnerability that is being checked, they receive points. If they take an action that makes a system less secure, they lose points. Teams can also gain points by answering forensics questions about actions they took to solve their vulnerabilities. Teams can checked their progress on their score report page. During competition, a live scoreboard is available for teams to see how they stack up against others in the country. These scores are unofficial and undergo review by CyberPatriot staff following the competition.